EAU CLAIRE, Wis. (WEAU) We flip the calendar page to December this weekend while welcoming the start of meteorological winter, and perhaps on cue, it will come with winter weather. A developing storm will track from the Southern Plains up to the northeast and near Iowa Saturday, before shifting to the east and into Michigan by late on Sunday. On this track, we will remain on the colder side of the low, but with limited cold air in place, milder air from the south will push north into parts of Wisconsin, leading to a wintry mix of precipitation. WHAT: Snow, though some sleet and freezing rain is possible. WHEN: Precipitation arrives between 2pm - 5pm Saturday. There may be a lull at times through the night while becoming steadier by early Sunday morning. Snow will begin to exit through the afternoon. HOW MUCH: At this time we are forecasting a total snow accumulation of 3-5". Any sleet or freezing rain is likely to be brief enough to limit any possible ice concerns. OTHER DETAILS: We may see the precipitation start as a mix of snow, sleet and freezing rain but any mix should quickly change to snow. During any lulls at night there may still be a bit of mix at times before changing to all snow before daybreak Sunday. OTHER IMPACTS: Winds will be increasing from the east and northeast as this storm lifts up into the area. Sustained winds of at least 15-20 mph can be expected by noon Saturday, with gusts around 30 mph. Similar winds will carry through much of Sunday as they gradually shift more to the north and northeast. With temperatures around freezing, the snow will be a heavy wet snow, so go slow and take breaks if needed when getting out and clearing your sidewalks and driveways. WHAT: Snow, sleet, ice and rain. WHEN: Precipitation arrives between 9am - noon Saturday. There may be lulls at night while becoming steadier overnight and continuing into Sunday before exiting mid-late afternoon. HOW MUCH: Any mixing will have an impact on snow accumulations but most areas can expect at least a few inches of snow. We are forecasting 1-3" for the immediate La Crosse area, but some of the hillier terrain in the county and beyond will likely see at least 3-5" with locally higher amounts. Just north there may be a swath of 4-7" extending from parts of Trempealeau and Buffalo counties, extending west into Minnesota. OTHER DETAILS: Temperatures will remain very marginal until Sunday morning, so in addition to snow, much of the front half of the storm may include sleet, ice and rain, which will limit initial accumulations (except over higher terrain). By Sunday morning colder air will filter through all levels of the atmosphere, with just snow expected. OTHER IMPACTS: Increasing east to northeast winds up to 20 mph will gust to 35 mph from mid-morning Saturday into Saturday night. Winds will remain pretty steady through much of Sunday. 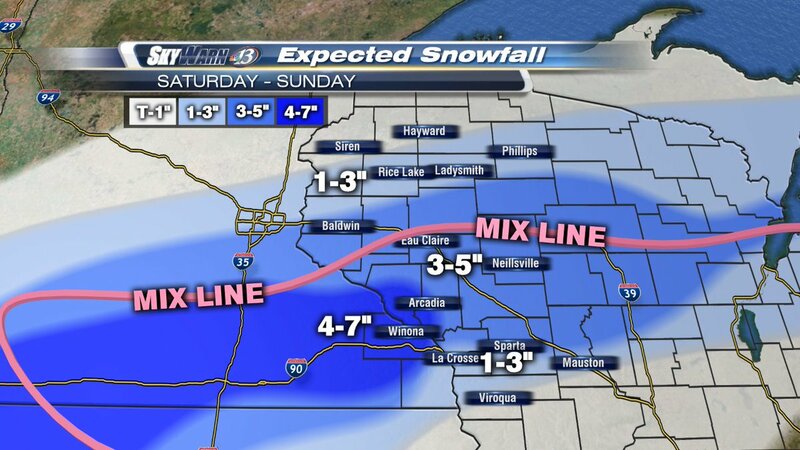 Here is a look at the most recent weather alerts and our official snowfall forecast this weekend.